We believe everyone should have the time to, and take ownership for, learning and sharing knowledge. We believe we need to start marketing the benefits of working in media & marketing across all industries. We believe work and life balance should be a critical KPI. We believe we need to re-assign value to creativity as a key component of EBIT. We believe every business should define its own values around fun and what balance looks like. We believe it is the fundamental duty of every manager to actively coach and mentor their people and encourage individual contribution without inhibition. We believe measurement should move from opportunity to see to opportunity to influence. We believe in mobilizing future decisions not justifying past ones. We should embrace intuition. We believe that planning as we all know it needs to change and that the responsibility for planning must reside with the client. We believe the best outcomes will come from more time and more TLC. We believe in healthy, collaborative debate, as an essential start point of the planning process. We believe transparency of information will deliver more effective results. 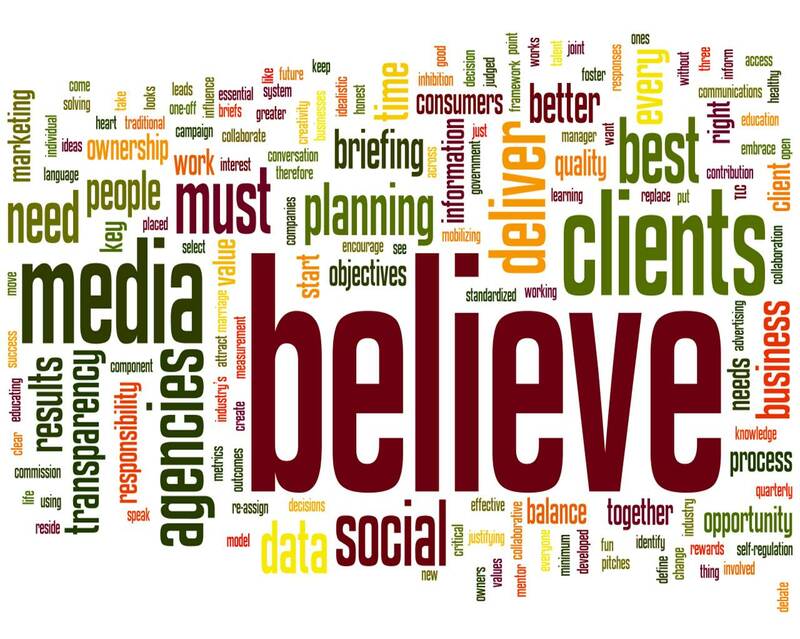 We believe in quarterly briefing to media owners to share key client objectives. We believe that there are three people in this media marriage, and that that’s a good thing! We believe there should be a minimum quality or standard for briefing from media agencies and responses from media companies. We believe open access to information leads to better briefing and better work for clients. We believe social is not just a media, but a behaviour. We believe that social must be an ongoing conversation, not a one-off campaign. We believe we must keep educating clients about social media and what it can deliver. We believe we should be using social data to inform every communications decision. We believe social media can deliver success against traditional metrics but shouldn’t be judged by them. We believe clients need to create a framework that allows them to select the agencies that are best placed to deliver business objectives and collaborate together. We believe that briefs should be developed in collaboration between clients and agencies. We believe businesses must be clear and honest about what they want. We believe that agencies have a responsibility to educate clients on how advertising works. We believe that no one enjoys pitches. We believe we need a new pitch process to identify the right people and the right ideas for the business. We believe self-regulation is in the industry’s best interest, but is too idealistic and therefore government needs to be involved. We believe data language must be standardized so that agencies and clients can speak together to put consumers at the heart of planning. We believe in joint ownership of data between consumers and industry for greater value, transparency and better quality data. We believe we should replace the commission system. We believe there should be a model that rewards time spent, output and results. We believe we should foster transparency and education between agency and clients. We believe solving this issue will attract the best talent and deliver the best results for clients. it’s so strange and awesome seeing them up there… the sentiment of some of the articles, like ‘We believe in mobilizing future decisions not justifying past ones’ is challenging, constructive and intuitive all at once. it’s a diverse and broad list… implementing some is merely changing your perspective, implementing others (‘We believe we should replace the commission system’ for example) are a much longer project. some need evolving – the article of belief around social media measurement for example should, I expect, be developed to incorporate a preferred metric or set of metrics for social media investment.